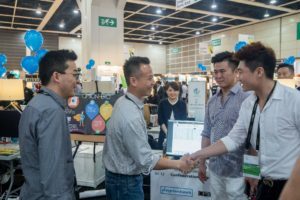 More than 270 exhibitors participated at Entrepreneur Day, HKTDC’s fair held on May 17-18 at the Hong Kong Convention & Exhibition Centre. 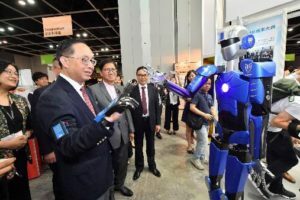 Among the fair highlights was a dedicated exhibition zone, the Imaginarium, which brought together more than 140 start-ups, featuring a wide range of innovative products and technologies in fields such as healthtech and biotech, fintech, green tech, Internet of Things (IoT), artificial intelligence (AI) and robotics. Officiating at the opening ceremony are Nicholas Yang, Secretary for Innovation and Technology, HKSAR Government (fourth from right) and Raymond Yip, Acting Executive Director, HKTDC (fourth from left). Start-ups from the Chinese University of Hong Kong, City University of Hong Kong, the Hong Kong Polytechnic University, Hong Kong Cyberport, as well as start-ups recruited by Advantage Austria Hong Kong, brinc, and CoCoon demonstrated their latest inventions and smart technologies in a series of demo sessions. Among them were the world’s first handheld affordable hybrid-spectrometer powered by AI, the world’s first mobile air conditioner, a single breath analyser to diagnose different diseases, and an online social platform for drone pilots to manage their profiles and portfolios. Featuring start-ups from Canada, Estonia, India, Indonesia, Portugal, the UK and the US, it also added a global flavour to the show. Entrepreneur Day [E-Day] also featured a host of informative talks as part of the “Start-up Runway”, including “What’s next for Fintech?”, “AI for the Future”, “Smart City – from IoT to IoE (Internet of Everything)”, “Embracing the Era of HealthTech” where successful start-ups discussed upcoming trends in their respective industries. Speakers included industry leaders such as Bonnie Cheung [already featured in an interview for Innovation Hong Kong], Venture Partner of 500 Startups, Lawrence Tzang, Co-founder and Chief Scientific Officer of Prenetics Limited, and AI expert Miles Wen, CEO of Fano Labs Limited. 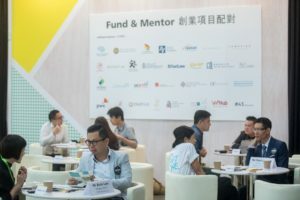 As noted in the Innovation Hong Kong interview with Stephen Liang,the HKTDC launched a new incubation programme entitled “Start-up Express.” Collaborating with Our Hong Kong Foundation, it offers start-ups unique opportunities to learn, to grow and to connect. Twenty finalists presented proposals and pitched to a panel of judges, including Antony Leung, Group Chairman & CEO of Nan Fung Group at E-Day. The ten winners join an exciting programme of local and overseas trade fairs and missions to explore global markets and gain valuable exposure, and have the opportunity to get personal advice from business leaders such as Vincent HS Lo, Chairman of the HKTDC and Victor Fung, Group Chairman of Fung Group. One of the key aims of E-Day was to connect fledgling entrepreneurs with industry experts and investors. 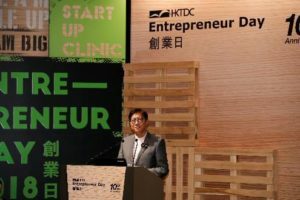 HKTDC also launched “Start-up Clinic” at E-Day, offering one-on-one customised business advisory services for new businesses. Its aim was to help them avoid or solve problems in the areas of financial management, information technology application as well as branding and marketing. Start-ups were also able to meet potential investors and mentors at the “Start-up Mixer”. 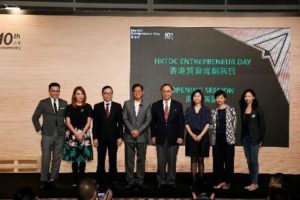 Co-organised by the HKTDC and the Hong Kong Federation of Youth Groups, this networking event took a similar format to speed-dating, allowing new businesses to indulge in creative ideas and opportunities from a wide scope of industries. During the “Fund & Mentor Business Matching Session”, one-on-one matching was arranged for start-ups to meet with potential investors and mentors to gain entrepreneurial advice and funding. New to E-Day this year the “Start-up Battle: Working in a Start-up”- tailored for people who want to join a start-up. It allowed participants to learn more about the start-up scene and the qualities that start-ups are looking for when recruiting talent.